George Lucas worked for over twenty years to bring Red Tails, the story of the African-American Tuskegee Airmen in World War II, to the big screen. The result is a mixed bag: Red Tails tells an important story and some of the mid-air battles are spectacular, but the film is marred by cheesy dialogue and cookie-cutter characters. Anthony Hemingway directs, with Lucas on board as executive producer, and the film soars when the men take flight to prove their worth to central command. A host of talented black actors, including Terrence Howard, Cuba Gooding Jr., Nate Parker and David Oyelowo, fill out the ranks and struggle through the film's hokier scenes. The Tuskegee Airmen form the 332d Fighter Group in the United States Air Corps during World War II, and are saddled with aging planes and babysitting assignments instead of true combat missions. Maj. Emmanuelle Stance (Gooding Jr.) and Col. A.J. Bullard (Howard) know their pilots deserve respect, and Maj. Stance convinces the Air Corps to allow the Tuskegee Airmen to cover Allied landings in Italy. 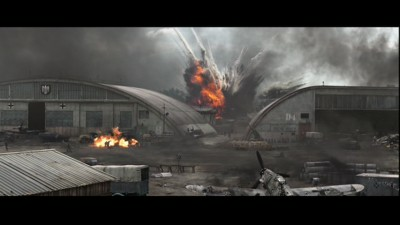 They perform admirably, and go beyond their assignment to locate a German command base and destroy many Nazi aircraft. Central command resists using the Tuskegee Airmen, but other American pilots begin requesting them after their successful mission. 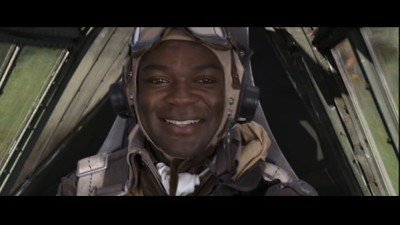 Red Tails focuses on several pilots: Joe "Lightning" Little (David Oyelowo) is an impulsive maverick, and Marty "Easy" Julian (Nate Parker) turns to the bottle to numb his discontent. Also flying are Ray "Junior" Gannon (Tristan Wilds), Samuel "Joker" George (Elijah Kelley), Andrew "Smoky" Salem (Ne-Yo), and Leon "Neon" Edwards (Kevin Phillips). Each pilot is an affable character, but none is particularly realized. The men have a natural camaraderie in group scenes, but Red Tails only gives Lightning, Easy and Junior things to do outside their cockpits. Lightning lashes out at racist troops, Easy meets a beautiful Italian woman, and Junior fights to return to the sky after getting injured in battle. 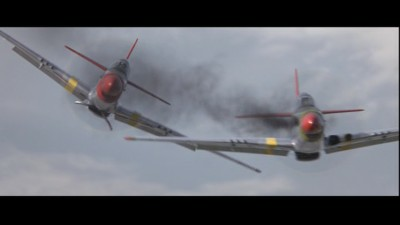 The aerial dogfights in Red Tails are pretty spectacular. The filmmakers use thoroughly modern techniques to create believable action, but the scenes have a pleasingly old-school vibe. 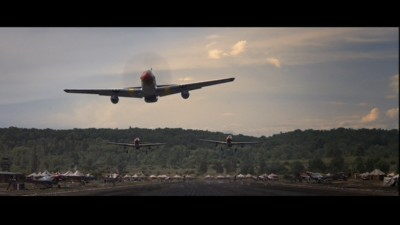 Lucas knows how to use CGI effectively, and Red Tails uses clouds, landmarks and other aircraft to create a sense of speed, direction and vertigo in the sky. Much of the action is filmed from outside the planes, and inside shots are generally limited to the cockpit view. The various WWII-era planes are nicely realized, and the battles take place over some beautiful European landscapes. If only the script was as impressive as the action. 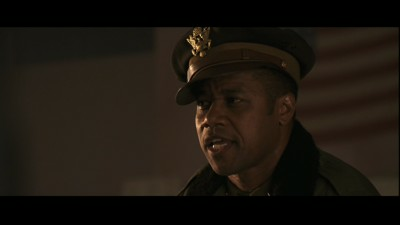 Red Tails is a fictionalized story of the Tuskegee Airmen, but the underlying struggle is rooted in reality. After such a lengthy gestation, one would assume Lucas and company would have created more compelling characters. It feels like the filmmakers wrote down a list of the characters and gave each man two adjectives by his name. Lightning is "reckless" and "stubborn" and Maj. Stance is "persistent" and "tough." Some of the in-cockpit exchanges are really bad. As the pilots fly away from a successful mission they speak back and forth over their headsets. These conversations should be natural and free flowing but are stunted and awkward. The brief exchanges by German troops are laughably bad and feel like a war parody. At the end of the day, Red Tails is an entertaining and uplifting film despite its overly simplified characters and weak script. Lucas' production ensures the excellent visual effects, but the Tuskegee Airmen deserve a better film about their accomplishments. 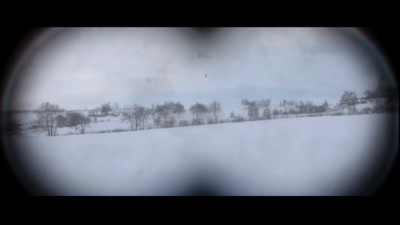 The only extra is Double Victory Highlights (15:10), a small section of a longer documentary available on the Blu-ray. This piece provides some interesting background on the Tuskegee Airmen and WWII, as well as the struggles of black pilots. 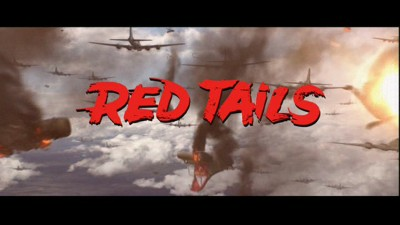 Red Tails should have been much better. The story of the African-American pilots of the Tuskegee Airmen in World War II is an important one, and the men struggle against a racist command content to give them aging planes and babysitting missions. 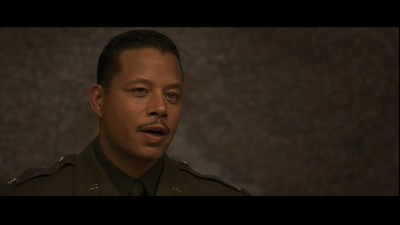 George Lucas produces and the visual effects are expectedly excellent, particularly the dogfights, but actors Terrence Howard and Cuba Gooding Jr. struggle to overcome a weak script that barely outlines its characters. Rent It.